Currently there is only one vivo phone with a Snapdragon 845 chipset – the NEX S. There just might be a second phone on the way, though Geekbench 4 doesn’t give enough details to tell for sure. 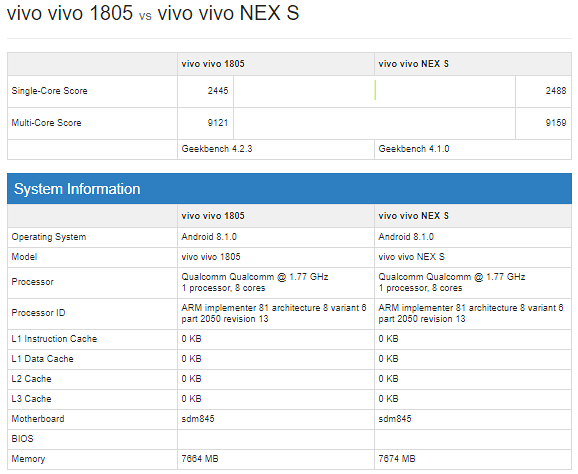 A “vivo 1805” was benchmarked with Qualcomm’s top chipset. It ran Android 8.1 and packed 8 GB of RAM. There’s a few megs of difference between the NEX S and the 1805, but again that’s not enough to be certain that these are different devices. Looking at vivo’s lineup, it can definitely use a few more Snapdragon 845 entries. There are plenty of phones with the Snapdragon 660 – like the Z1, V9 6GB, X21 and its UD version and others. So the premium mid-range segment is well covered, but another flagship would be nice. I have a NEX S and it's codename is PD1805. So I can confirm, it is the NEX S.
What are you talking about? If Vivo isn't innovating, not sure who is.